The U-A100 SLR underwater housing can be used on small boats, in the surf, while swimming, snorkeling or diving. It`s easy to operate the camera as its various components and buttons can be operated through the PVC. The most common, current application is in video production. And to then use this housing with a Sony A7, an adapter like the Metabones and one of the large diameter Canon lenses. The U-A100 is designed to fit almost all common SLR cameras on the market today, irrespective of the manufacturer or model. 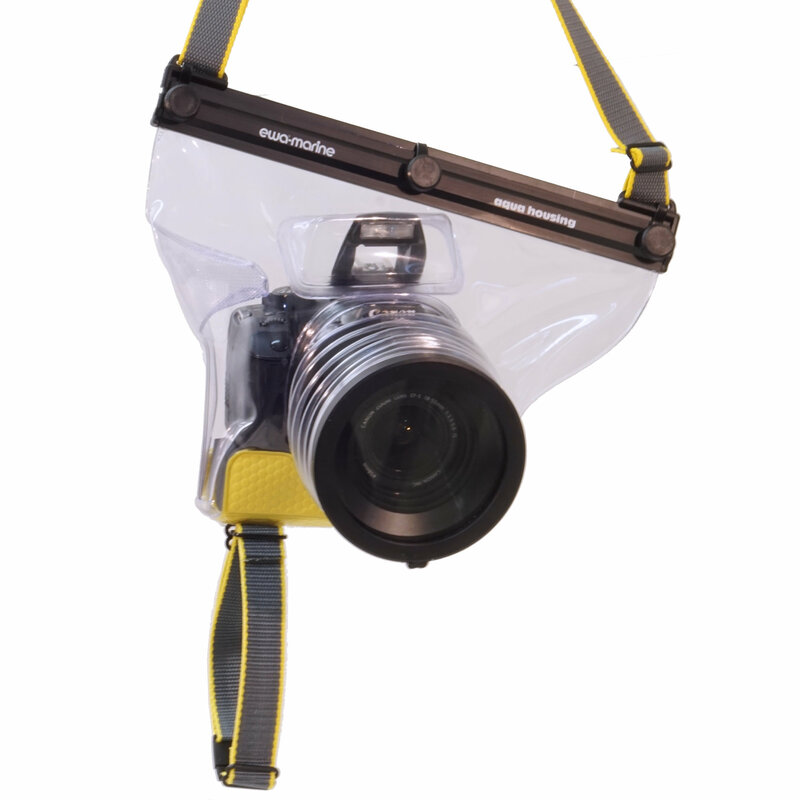 With this housing, a whole new world of applications opens up for your standard SLR camera: Inside the housing you can now take the camera safely canoeing, snorkeling or even diving, up to a depth of 20 m / 60 ft.
As off 2019, our U-A100 is now shipped with the new ewa-marine safety-wrist-strap. Simply slip your hand through the loop at the bottom and, if the camera accidentally falls out of your hand, the loop automatically locks and secures the underwater case to your wrist. And yet it is easy and quick to open, when required, with the integrated buckle. Keep in mind: If you do not have one of those large diameter lenses, the "standard" U-A will be the better choice. And if you do ever end up needing the larger front port, then the SF100 port can always be fitted by our customer service at some point in the future. The U-A100 is a practical, "all-round" housing that is primarily intended to be used while swimming, snorkeling and other, general water sports. While it can also be used for scuba diving, for lack of a strong, external strobe, and because the camera's small, built in flash is to close to the lens, resulting in small, suspended particles in the water showing as "snowflakes" in the picture, i.e. can not be used in most applications, the U-A100 is limited to 20m / 60ft. A depth where you also can still take pictures with ambient, natural light. Since underwater photography generally requires the use of wide angle or macro lenses and thus shorter lenses, the lens tubes on the housing is kept rather short. U-A: for consumer style SLR for up to to 20m / 60ft dive depth. Ideal if your largest lens diameter is smaller than a 72mm filter thread. U-AX: SLR with top mounted strobe for up to to 20m / 60ft dive depth. Offers better illumination of the subject under poor light condition. U AXP100: SLR with top mounted strobe and up to to 50m / 150ft dive depth. Primarily for scuba diving. Designed specifically for consumer style digital dSLR, large mirrorless system-camera as well as the "old style" analog 35mm SLR cameras, the ewa-marine U-A100 underwater housing is manufactured from our special, double laminated PVC and has an integrated, optically neutral flat glass as a front port. With this housing you will receive an 82mm filter adapter and a RA77-82 step-up ring. By means of thess adapters the camera is then docked into the housings front port (which is bigger on this housing then on the standard U-A), ensuring that the lens remains parallel and centered behind the front of the lens. Just as if it were a clear, neutral optical filter.